Home Unlabelled ASUS ROG Strix GL553VE the feature loaded Powerful Gaming Beast……. ASUS ROG Strix GL553VE the feature loaded Powerful Gaming Beast……. ROG Strix GL553 is a latest and powerful device from the house of ASUS that runs over Microsoft Windows 10 preinstalled. It packs powerful hardware like Intel’s latest Intel® Core™ i7 – 7thGeneration 64Bit Quad Core Processor that is paired with NVIDIA® GeForce® GTX1050Ti Pascal® Graphic Processor Unit supported by Microsoft provided latest DirectX version 12.0. 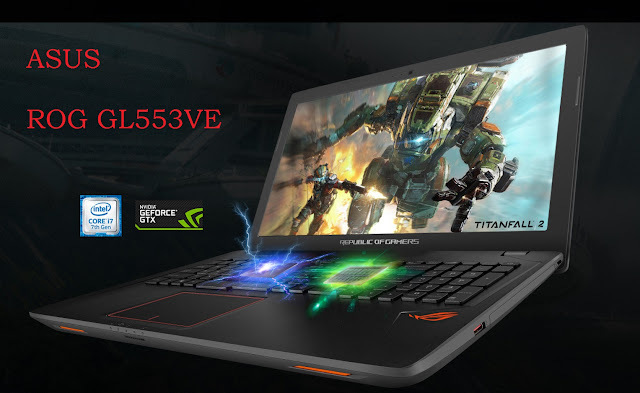 All these hardware and software components not only helps to perform a smooth – flawless – uninterrupted high graphics and 3D gaming but power efficiency is also given in this powerful attractive Laptop from ASUS, which also enhance the User satisfaction and provides a great work experience on it. ROG Strix GL553 Laptop comes with a specially designed gaming keyboard with some special features like 2.5mm Travel Distance, 30(N-)Key Rollover, Isolated Arrow Keys. It keyboard is a chiclet gaming keyboard that has 4-area RGB(RedGreenBlue) lighting and Red Backlit Scissor-Switch keys given to provide a 2.5mm travel distance that is an experience to type or use keys with a perfect & proper distance between the keys. 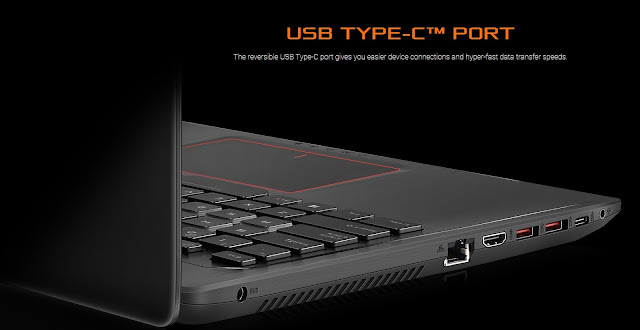 It comes with isolated Arrow Keys and a big large sized Space Bar on top to make it within reach and easy to use. ASUS provided Intelligent Thermal Design in it to that much supports in intense gaming marathons. Its ROG-exclusive Cooling Overboost helps to adjust the speed of the fan. It also has an intelligent thermal design to provide it with a maximum cooling efficiency that also enhances it stability to remain cool for a long time gaming experience. Strix GL553 Laptop comes with a Matte finish Panel to decrease the extra glares and distraction of the reflections. It has 15.6 inches wide viewing angle display screen with 1080p Full Hight Definition resolution with great contrast and color consistency that provides real color and colors doesn’t distorts when viewing from different angles. This Laptop also having an incredible increased and energy efficient huge memory standards of 32GB of DDR4 category RAM. It also helps to boost its performance to the lighting fast speed. Inbuilt ports that it has – 1LAN Port, 1HDMI, 2Super Speed USB 3.0-3.1, 1Type ‘C’ Latest Fast USB Port for faster data transfer and One 3.5mm Audio Output Jack port given in it. It also has inbuilt good quality speakers in it. Its microphone comes with the noise cancellation feature that helps filter out ambient noise for clear voice recording. It has TITANFALL 2 - NVIDIA GeForceGTX Trademarks. Overall its an amazing Power Packed Gaming Device that’s why ASUS says "GAMING WITHOUT LIMITS"……..